Hey Mike, hey Mike. Guess what day it is?! Oops, sorry, Wednesday isn't until tomorrow. That doesn't mean we can't celebrate Tuesday by linking up and posting our randomness with Random Tuesday Thoughts, hosted by Stacy Uncorked. Friday night I got dolled up and attended Night to Shine, a prom for people with special needs. Tim Tebow (yeah, that one!) started Night To Shine last year and it was a success. This year was just as great, with 200 churches in 8 countries taking part. I'll talk more about Night To Shine tomorrow, but this is a picture of me with my buddy, Cara. It was her red carpet entrance photo. I had a blast with her. My only complaint is that it didn't last longer. Three hours wasn't enough to eat, dance, and be merry. My kitty got her parts fixed. I did the Bob Barker thing and had her spayed. It was a miserable 24 hours without her. My mom is back in the hospital for the umpteenth time. She's been in there since Friday and they're not quite sure what her specific diagnosis is this time. She should have her own VIP room by now. We had an official proposal happen at my house Saturday evening. My niece's partner, who has been with her for a tad over nine years now, finally proposed to her! They have two children together, with a third one on the way. Bout time they tie the knot! For the first time in the 14 years we've been together, Jason and I didn't purchase gifts for each other for Valentine's Day. It was my idea. Rather, we lounged around the house after church and ordered in bar food. Valentine's supper was a Patty Melt, chicken gizzards, and cheese balls. Bar food is the best. What's your randomness for the week? How did you celebrate Valentine's Day? Sorry to hear about your mom. Praying for a speedy recovery for her! 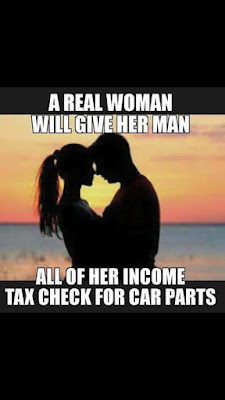 And, I am not a real woman either. Unless those parts are going on my car, no car parts will be bought with our return. Love that you did the Night to Shine - can't wait to hear more about that. What a lovely event. Sorry to hear about your mom . . . hope she gets answers and feels better soon. Get better soon, Terra's Mom!!! I hope whomever dared insult your family in your own home got thrown out on their own face. Hard. Sounds like a good week! I hope your mom is doing better. I like the way you celebrated Valentines Day...sounds like a good day in relaxing together. I love the sound of that ball Tebow started -- and no, you definitely need more than 3 hours for that kind of fun! But it sounds like it was a blast. The N word? Really? It's 2016, I can't believe this is still an issue. I hope he got a good "reminding!" Praying for a speedy recovery for your mom. So sorry about your mom - here's hoping they find answers soon and she's on the mend even sooner! I think I'm going to adopt you and your hubby's idea of celebrating Valentine's Day - waaaaay better than the 'norm' which is rife with disappointment! I wouldn't be a 'real woman', either...heh!!! Sorry to hear your moms back in the hospital.I'll keep her in my prayers.I eent to my moms on valentines day for lunch. I went to my aunties memorial service on the 24th.Nothing exciting here.